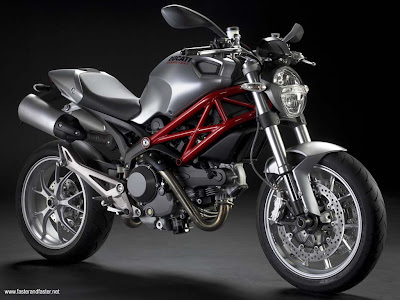 Both, the 2009 Ducati Monster 1100 and 1100S get a brand-new single-sided swingarm, while the 1100S also gets higher-spec Öhlins suspension, gold-painted wheels and carbonfibre front fender. Both the bikes are fitted with the same 1100cc v-twin, which makes 95bhp at 7,500rpm and 10.5Kgm of torque at 6,000rpm. The Ducati engineers have managed to obtain a motorcycle even more essential that with its 169 kg 168 kg for the S version being the general public as the lightest in its class. The Monster 1100 and 1100 S, both sold under the cupolino and coprisella series are equipped with the charismatic-cylinder 1100 cc Desmodromico 2 valves, famous worldwide for the unique character provided by 95 CV paid to 7,500 rpm dall'impressionante min and torque of 10.5 Kgm to 6000 rpm.